In April 2017 the federal government introduced a bill to legalize recreational cannabis by July, 2018. The federal bill outlines a framework for regulating cannabis production and sets standards for health and safety, establishing criminal prohibitions, and clarifying what aspects of cannabis regulation will be the responsibility of the provinces. On November 16, the Government of Alberta introduced Bill 26, an Act to Control and Regulate Cannabis based on its cannabis framework. The City is thinking about how legalizing cannabis will affect us locally and how we can manage legalization in the best interests of Calgarians. 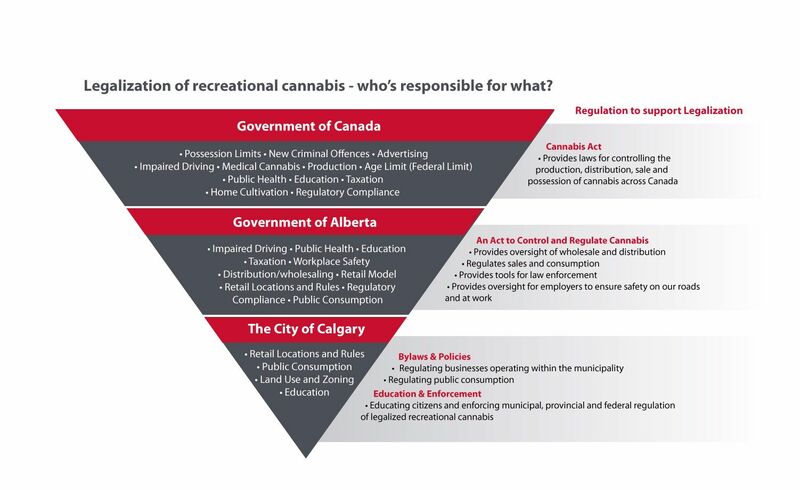 Here in Calgary, your input will be an important part of this process and will inform changes and updates to affected Calgary bylaws, and the development of new bylaws and policies to respond to the legalization of cannabis. In November of 2017, The City of Calgary held stakeholder workshops with representatives from community and business organizations to discuss policy and regulation areas regarding business licencing, community standards bylaws, land use planning and other affected bylaws. From November 20 to December 10, The City of Calgary hosted an online feedback form on this page to solicit feedback from Calgarians. Input from both the workshops and the online feedback form is being used to help inform changes and updates to affected bylaws, and inform whether new bylaws or policies are required to respond to the legalization of recreational cannabis. The consolidated report includes a high level summary from the three workshops and online feedback. To review the verbatim feedback, refer to the individual workshop and online What We Heard summaries. This feedback form is now closed. Thank you for your input. The Government of Canada has indicated that recreational cannabis will become legal by July 2018. Provincial governments across Canada will be responsible for deciding how recreational cannabis will be distributed and sold within their provincial boundaries. The Government of Alberta has indicated that municipalities across the province will have a role in developing policies and regulations for recreational cannabis that are within their control and responsibility. The City of Calgary is looking for feedback to help inform changes and updates to affected bylaws, and input on developing new bylaws or policies to respond to the legalization of recreational cannabis. The Government of Alberta has indicated that rules will be established to guide locations and hours of operation for specialized cannabis retail stores. You have 25 characters left. The Government of Alberta's proposed legislation would allow for two kinds of retail sales in Alberta: privately operated retail stores and government operated online retail. More details around how privately operated retail stores will be regulated and licensed are expected in early 2018. Are there preferred areas where private retail stores SHOULD be located? Why? Are there preferred areas where private retail stores SHOULD NOT be located? Why? Once recreational cannabis is legal, how likely might you be to purchase cannabis from a retail store? Once recreational cannabis is legal, how likely might you be to purchase cannabis online? The Government of Alberta has proposed that Albertans will be allowed to consume cannabis in their homes and in some public places where smoking and vaping tobacco is allowed. Use will be banned in cars, in areas frequented by children, from hospitals and school properties and from any place where smoking and vaping tobacco is restricted. Municipal governments may have the ability to further regulate where cannabis can be consumed. The City of Calgary also regulates smoking and vaping tobacco through the Smoking Bylaw. This bylaw restricts where people can smoke or use e-cigarettes by banning smoking in indoor public places (any place where the public may have access) and at outdoor public facilities (transit stops, playgrounds and outdoor recreational areas). Under the Government of Alberta's Gaming and Liquor Act, people can only consume alcohol in a private residence, or in a licensed premise, such as a bar, lounge, or restaurant. Consuming alcohol in public places (buildings open to the public, streets and vehicles) is prohibited. How should The City of Calgary approach cannabis use at festivals and events? Initially, venues specific for consuming cannabis will not be permitted. Bill 26 provides the Government of Alberta with authority to license these types of establishments in the future, and this issue will be re-explored once the system for cannabis is established and guidelines for edible cannabis products have been set by the federal government. Although the Government of Alberta will not make any decisions about consumption venues for some time, if provincial regulations eventually do allow for this would you support or oppose venues which allow consumption in the form of smoking or vaping? Although the Government of Canada will not make any decisions about legalizing edible cannabis products for some time, if provincial regulations eventually do allow for this would you support or oppose venues which allow for consumption of edibles? Federal laws will allow Calgary residents to grow a maximum of four plants per household. The Government of Alberta has indicated that it will align with the federal government’s decision, but will restrict growing to indoors. Growing cannabis plants outdoors will not be allowed. The Government of Alberta has also indicated that renters, condo-dwellers and those who live in multi-family dwellings may be restricted from growing cannabis in their homes based on rules established in rental agreements or condominium bylaws. Where should cannabis plants be permitted to be grown? Do you have any other comments relating to The City of Calgary's role in the legalization of cannabis? You have 350 characters left. To help us better understand your previous responses, please complete the following questions. Do you support or oppose the legalization of cannabis for recreational use in Canada? Do you have children under the age of 18 in your household? What are the first three digits of your postal code? Public engagement on the legalization of cannabis will be completed by December 10, 2017. All feedback collected will be shared with Calgarians on this page through a 'What we Heard' report. Feedback will be considered and a 'What we Did' report will be shared in the winter of 2018 to show how public feedback informed the proposed amendments to bylaws and potential creation of new bylaws. The proposed bylaw amendments are scheduled to be presented to Council in April 2018. If approved by Council, the changes will be implemented and the development permit process will be initiated to prepare for legalization in July 2018. Sign up for Legalization of Cannabis email updates.